It's hard to think about potpourri without sneezing; the very idea of dried husks and petals in a decorative bowl screams dust and must. 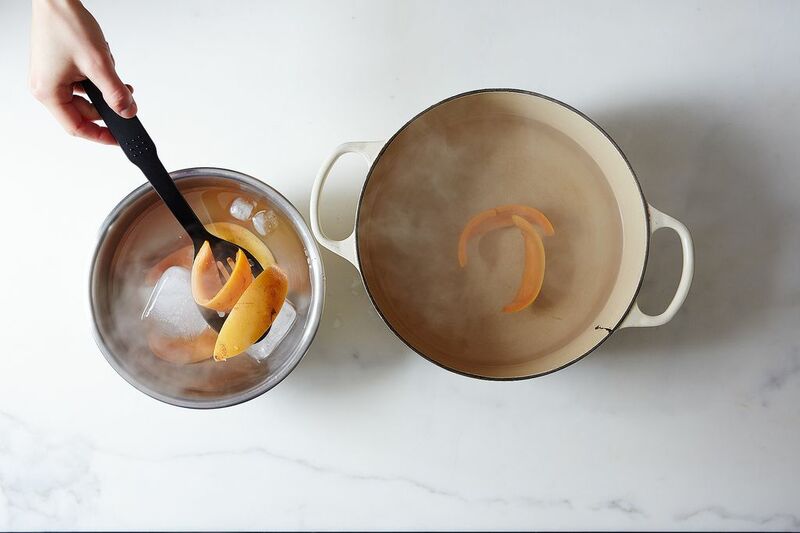 Which is why many take to the stovetop method, especially during the holiday seasons—though does a bubbling gunk of reduced wine, orange segments, and cloves really do it for you? I'd rather just get whiffs of sappy evergreen-smell, or fresh rain-smell, or wet tree-smell all year long. 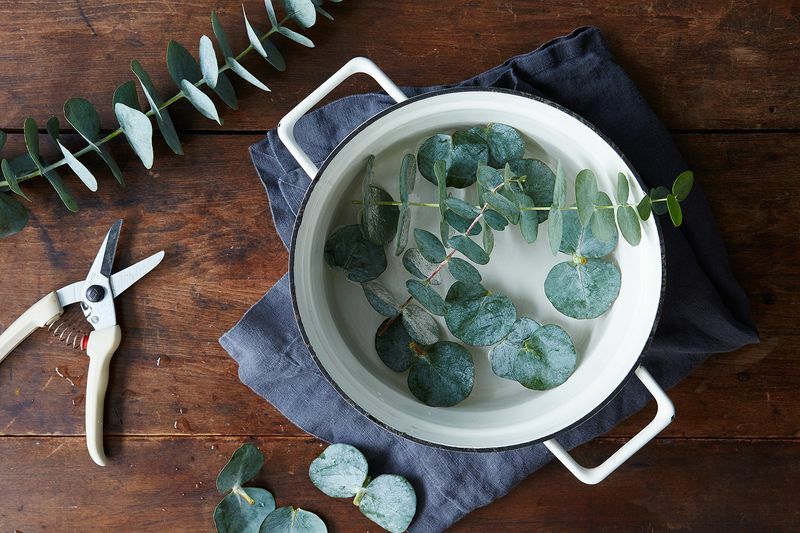 With this in mind (and also because some fabric-dyeing experiments made us realize that simmering eucalyptus leaves give off a heavenly, spa-like scent) we decided to come up with some stovetop alternatives to the classic holiday in-a-potpourri mixes. Just drop them in some water, set the pot to a low, low simmer, and waft away. Bonus points to the cook who puts scraps to this purpose! Here are some ideas for better-smelling stovetop potpourri. Using essential oils would work, but the scent might not linger as long as if you use whole ingredients. Add plenty of water to cover, heat over your burner's lowest setting, and breathe in deeply. It should at least tide you over until dinner. Eucalyptus photo by Alpha Smoot; orange peel photo by Mark Weinberg. We first ran this post last year, but brought it back for all the holiday good-smellies. How do you make your whole house smell good (besides baking cookies)? Let us know in the comments! This is not very creative, but I have an old canister of mulling spices that I would't want to use for beverages. A handful of those in a pot of water makes the house smell terrific. Where can I order "clean" ingredients (i.e. eucalyptus, juniper berries,), or untreated stuff to make this recipes, when they are not readily available in local natural food stores? Every year when fall would arrive, our dad would place a pot on the stove with water and add orange peel, apple peel, cinnamon, cloves, and we knew the holidays were coming soon! I use all of those ingredients plus Star Anise and I use the mini-slow cooker pot. I add water as needed. The house smells like the holidays! Love It! Juniper berries and bay leaves boiled, then reduced to a simmer in a saucepan creates a heavenly woodsy fragrance throughout the house. Love this idea. Bonus humidification, too! Making Claudia Roden's orange and almond cake makes a lovely smell as you have to simmer oranges for two hours. And then you bake the cake for another hour. Smells delicious and tastes wonderful. where can or could I find eucalyptus?? My Trader Joe's has tons of it. If not, flower shops or supermarket floral sections may carry it this time of year. Michaels carries the dried, which smells great. I can find it at the grocery floral departments as well. A few years back, I won a Simon Pearce contest similar to this DYI. I suggested using the slow cooker with cinnamon, vanilla, allspice, and other fruity whole spices to make your home smell delicious. I often use a small pan on the stovetop too year-round. Please,please, would you mind to change/provide substitute for sandalwood on the article? I would really be thankful to Food52. It is a slow growing trees that is currently over-harvested and endangered. I know because I have seen it myself.